It was the middle of summer vacation at the end of an afternoon at Long Nook Beach in Truro. The sun cast long shadows and golden light on the low tide. Everyone was meandering in the surf and the tide pools and I was doing some meandering of my own up and down the beach, keeping everyone in sight, soaking up the final warmth of sun and letting the coolish water wash over my sunburned feet. Long Nook is not a good shell beach, and with boxes and boxed of Outer Banks shells languishing in my attic I had given up collecting all but the most unique shells. Over the years my husband has always brought me bits of translucent beach glass in lovely hues of green, white brown and the rare red or blue; with the advent of recycling collecting the bits of colored glass has become more of a challenge. It is trash turned treasure. At first I saw it as litter spat back by the sea, but now I am charmed by the weathered surface of a shard of old Sprite bottle or the rare bit of cranberry glass. And on that day in 2006, the amber lenses of my sunglasses made the green tones in everything pop out, and, with no beach glass in sight, I began to pick up the greenest pebbles and drop them into the deep pockets of my hiking shorts. After a long spell of patrolling the beach, squinting at the surf to watch everyone swim, it felt nice to hang my head, let the sun warm the back of my neck, look down and wait for something pretty to catch my eye. In those days, and sometimes now, vacations could be exhausting. Even though it is good to get out of the stale routines of home life, breaking that rhythm creates the sort of tension with which I am often uncomfortable. There are too many choices and five people to keep happy, and they all have expectations and needs that I am compelled to meet. Most of the time I am exhilarated by the challenge, but there are moments when it rankles. And so, with everyone happily occupied I allowed my mind to float with my eyes as I followed the tiny streams pulling the salt water back to the sea. 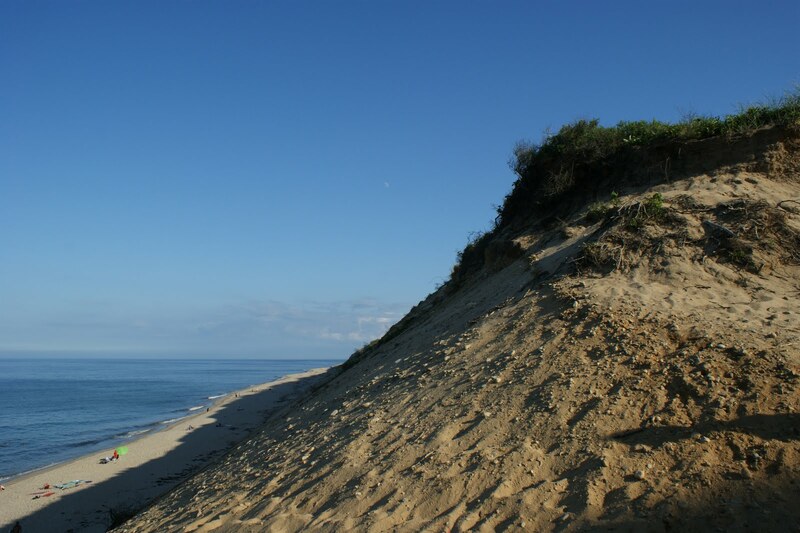 I thought about my own childhood vacations of Midwestern swimming pools and city museums, about my Iowa born and bred father and his passion for the sea, about the gift of the Edward Hopper’s light on these steep toasted dunes, about my mixed and intense feelings about the Cape. And with each new train of thought, a pebble made its way into my pocket. I considered that afternoon as it might form itself as memory in my children’s minds, about how it conjured all of the best things about childhood for my husband, whose very soul is fueled by salt air and sand between the toes, my desire to provide a hundred more days just like it to all of them and whether that might somehow assure that they are happy and fulfilled ten or twenty years on. My pockets were getting full and heavy. I mused if I would be able to get up the narrow path to the parking lot with such a load in my pockets and a heavy beach bag and cooler. I worried how much longer I could carry around all of the stories without collapsing under their collective weight. I asked myself if writing them down would make me feel better or worse. And in 2009 I finally have my answer.